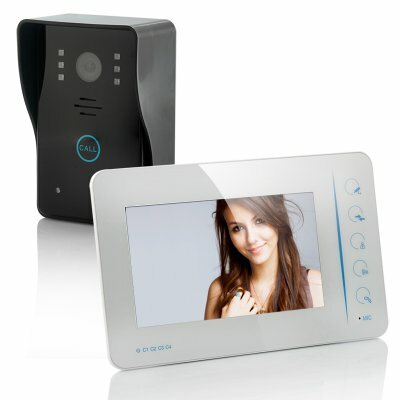 Successfully Added Security Video Door Phone Set - 7 Inch Monitor, Touch Button, 4x Video In to your Shopping Cart. Security video door phone set with 7 inch monitor, an included high quality door camera, touch panel control and 4x video in connections for a great value home entry way security camera and monitor system. This home video door phone security surveillance package is a complete set of surveillance equipment that features everything you need directly out of the box so you will always be aware of who is on your property. Featuring a large 7 inch monitor and 420TV line outdoor camera with 6 LED lights, you will be able to see in crystal clear quality, talk with and give access to whoever is at your door day or night, simply by touching a button. As an added bonus, both the video door monitor and the outdoor camera feature touch button input for streamlined and attractive yet still very intuitive touch friendly usability. This video intercom system also comes with 4x video input connections, meaning not only will you be able to install the high quality door camera provided in the box, but you will lso be able to connect 3 more cameras to the door surveillance monitor. With a possibility of four different cameras you will have full monitoring capabilities around your property wherever the blind spots might be, viewing any one of them on the 7 inch monitor whenever you need. In addition with a video out connection cable at the back of the 7 inch monitor, view camera feeds directly on your TV in your house without even having to get off your sofa. 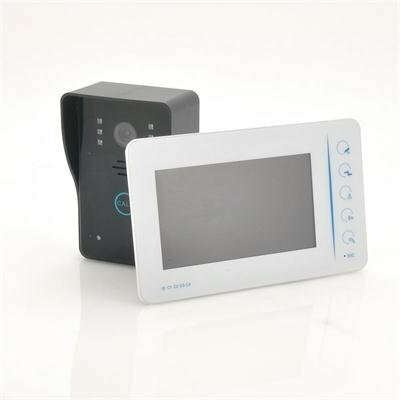 This touch controlled outdoor camera and indoor monitor video door phone set is a great buy for anyone wishing for an all in one quality protection surveillance system for their home. Available at a low price attractive to both end users and resellers, order your set now and we will ship it out within 24 hours. Brought to you by the leader in security electronics, Chinavasion.